Dean Baring and his colleagues in Australia have pulled off a very good website that builds on their Facebook page/forum as a place to go for thoughtful, intelligent and independent views on the harness racing industry and breeding. Love the low key videos making chatty announcements that have a really nice positive flow to them, without being the “PR-speak” of any organisation. However I would like to see a bit more transparency about who the website team is and how they got here – for those who don’t know the story. About the sires that “cross the lines” between pacing and trotting – and an interesting example of a pacing-bred horse (On Thunder Road) being a natural and very good trotter (by Bettor’s Delight) – we’ve looked at these crossovers on my blog too and it is always a good reminder to let a horse tell us what they can do best. Realmein, Blitzthemcalder and many others – and a few Bettor’s Delights and Elsus are going around as square gaiters at the moment. I like the way Harnessbred is developing this into a series, and will follow with interest. And also a series of well produced video clips that show their approach to stallion profiling, which is a mix of pedigree and performance, nicely wrapped up, perhaps lacking in a bit a back up re the mare’s pedigree and other factors that would best suit a sire. That is easy to fix – a link to the website that might provide some more detailed analysis of the breeding and other factors that your mare might add, but not canvas the whole spectrum of mares as many of the studs’ websites tend to do, just to make sure your mare is somehow on the list!! Their first sire analysis is on Western Terror. The best thing about Dean’s website and Facebook page is that it is determined to find a good future for harness racing. It’s committed, and some frustration with the current industry has not stopped his team coming up with a very active and independent news site. It complements Harnesslink and from the USA Harness Racing Update newsheet as good places to go when you want independent, interesting, sometimes opinionated but always thoughtful, articles about our beloved industry. None of the nitpicking, point-scoring forums of old, or the paid-for-advertising promotions. I’ve found myself lately needing a renewal of energy to keep coming up with a positive and fresh approach to the industry, having just had the “soft looking brick wall” reaction to my latest efforts in New Zealand by those who control these debates. So I am delighted to see Dean’s website adding to the mix of people pushing constructive ideas and views across the industry and across countries. It has my warm recommendation. 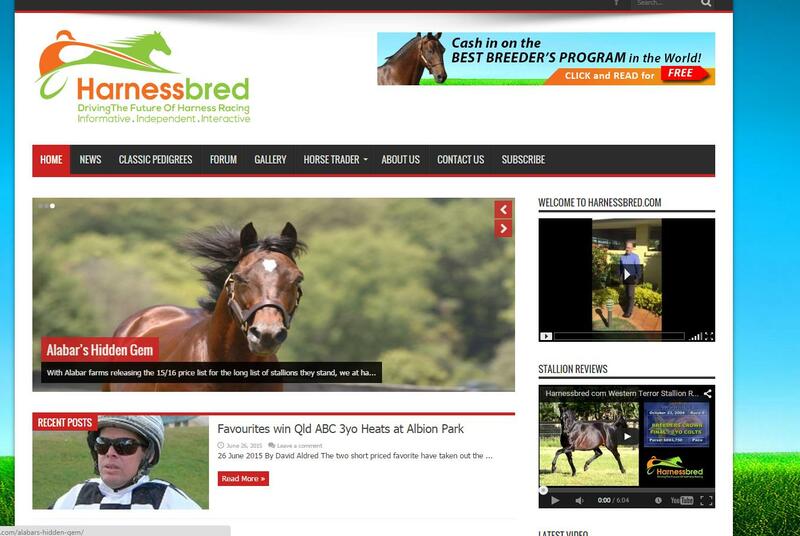 Meanwhile don’t forget to tune into www.b4breeding.com now and then to get that quirky, in depth, and definitely independent view of harness racing breeding – and an encouragement personally for those who want to get into breeding. A fire alarm callout at Alexandra Park tonight recalled the historical event from 1916 when the stand caught fire at Addington raceway. I recall a number of photos of the event, and some of them show not only the blazing stand, but the on track punters turning their backs on the fire to watch the exciting final straight finish of the race that was happening at the time. Go, you passionate harness racing followers! It was, after all, NZ Cup Day. Another fire in the stand happened in the 1950s, again at Addington. Is this the night for Courage Under Fire horses to show their worth? Good to see the old guy is still available to Australian breeders at $5,500, and he deserves a good book. One of my all-time favourites is “Might Mouse” as he was known. As smaller horses can show as racers and sires (like Bettor’s Delight, Tintin In America, Highview Tommy, and in older days ones like Good Time), size only matters when it comes to the size of the cup you win or the stakes you make. Update later same night: Ah, there you go, winner of the last at Forbury Park tonight a talented 4yo Courage Under Fire x Denice’s Dream (Armbro Operative) who now has 8 starts for 2 wins and 3 seconds. Nice. Australian blog readers might know the family through (I’m Elmer Fudd) who got about 8 wins and $50,000+ here before crossing the ditch to more or less double that in total. Zee Dana is a colt from Tintin In America’s first crop, so a 2yo now. He was bred by Dave Kennedy who made quite a comitment to the sire, and got some nice payback when Zee Dana was taken over to ready-to-run sales in Australia and performed/sold very well, and has recently appeared at Shepperton trials and will be racing tonight. His ownership has just been joined by NRL player Brett Stewart – read article here. He has his first up race start tonight Race 2 at Bendigo. All the best for that Dave! Another Tintin foal that is showing up well in Australia is Dame Puissant (also NZ bred), who has had just the two starts, both this month, for a second then a first. She is from a P-Forty Seven mare, and perhaps the most interesting thing in her pedigree is a 3×3 to In The Pocket through the maternal lines of her sire and dam. Of Tintin’s 15 Australian-bred 2yos, Just Wantano had three starts earlier this year for 2 wins, and has just come back after a spell for a 3rd on 12 June in a heat of the Vicbred 2yo Fillies series, quite a distance from the first two runners after being checked. Aussie Vista has been consistent with 8 starts for 1 win, 2 seconds and 2 fourths, but faded after setting a hot pace and being eyeballed in the final of the Group 2 Yearling Sales Series Final for 2yos at Redcliffe. And I believe another Tintin filly Velvet Kisses is having her debut this week as well. If you have bred or bought a Tintin, let me know how it is developing. Update as at 24 June: She won her workout (only three trotters in the field) but yet to hear any details. An interesting nomination for today’s workouts at Auckland is the 5yo trotting mare Isa Smiling (Pegasus Spur x Sun Isa), owned by Jo and Jack Davies who bought her at the 2011 yearling sales from breeder Kym Kearns. She qualified as a 2yo in April 2012 in a race where she was second behind Sheemon and in front of KD Hall. 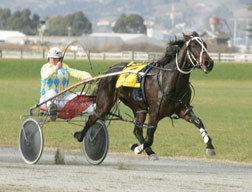 She is a big, beautiful trotter, sister to Flying Isa and with a heap of ability and speed. But she always had issues with settling at the start of races, often reacting strongly to lining up with other horses even behind the mobile. It became such an issue, getting her so worked up, that trainer John Dickie and the owners decided to stop trying and go in another direction completely – and put her in foal. Several years later she’s having a second go at the racing game, after foaling a Majestic Son colt in early September last year. I’m not able to get to the workouts this morning, as we already have an afternoon trip to Auckland planned for this afternoon, talking our “shuttle mare” Zenterfold back to Geoff and Aria Small. But I will be interested to see the results, and whether a complete break away for over 3 years has worked the oracle. Nostalgic means looking back with yearning affection to the past. But my new mare Nostalgic Franco is all about me looking to the future with interest. I managed to tie my hands behind my back and not buy a weanling at the recent Weanling and All Aged sales in Auckland and Christchurch….but I couldn’t resist this mare. She’s from a family that has been well regarded and has produced some classy horses. Her dam’s half sister Nevermore was a very good 2yo filly whose career went through to 4yo and ended up with $124,712. Other good ones from the close family are Franco Nester, Chancellor Cullen, and Natal Franco (who is the dam of the 3yo Art Major filly Princess Arts). If bloodlines count for anything, the boom youngster has much to live up to, being out of Notafella Franco, a Falcon Seelster mare from the stout branch of the Trilby taproot that produced two New Zealand Cup winners in world harness racing’s first millionaire Cardigan Bay and Globe Bay. Franco Nelson has gone on to win over half a million, including a second to Adore Me in last year’s New Zealand Cup. The family has become quite sprawling in its branches, and as usual not all of them will fire consistently. Many seem to produce just one really good one, but there is enough in the deeper and wider family to catch my interest. Will this branch throw up some really top horses? That’s my challenge. Nostalgic Franco is a 13yo mare by Rustler Hanover out of a Falcon Seelster mare. Rustler Hanover is a son of the great mare Rich N Elegant and with bloodlines to die for as a damsire. He has clicked well with Falcon Seelster mares in America (of the 16 foals on that cross, 25% of them have won $100,000+). Nostalgic Franco had a win and a couple of placings from just 8 races and showed a bit of ability before she threw herself on the track one day and hurt her back. She was put aside to heal, and with the numbers of new ones coming along at Spreydon Lodge, she never was a priority to get back to the races and ended up being bred from. She’s had 7 foals, 5 of racing age, for 3 to race and 2 winners to date, including 7-win Franco Nadal (although he is an accumulator rather than a brilliant horse). Franco Nikau (Lis Mara) won his first three races for Steven Reid and Simon McMullan, but he struggled a bit since going up in the grades or maybe he has some niggles. There are some potentially nice ones in the pipeline like the Bettor’s Delight 4yo mare who qualified very well late last year, a couple of Changover fillies, and a Gotta Go Cullen weanling. So apart from the Bettor’s Delight, it is very much a Nevele R/Spreydon Lodge pedigree. What really sold me on Nostalgic Franco is that she’s in foal to Tintin In America, and if you look at that match you can see why I might be interested. Normally I don’t go for simplistic double-ups, but these are very nice ones and beautifully structured. I have already bred a Rustler Hanover mare Sophie’s Choice to Tintin In America and we’ve got a strong, well conformed weanling colt (ownership shared with Lynda Mellsop and Ann Claridge). So for just $1,150 I’ve got a well-bred mare in foal to a sire that I think will really suit. She’s based at Macca Lodge with my other mare Dreamy Romance, who is due to foal to Big Jim. Where to with Nostalgic Franco this coming season? I’m taking a close look at the newcomer Sunshine Beach as a match – I’d be interested in what you think.